What It’s About: Sosuke (Frankie Jonas) lives with his mom, Lisa (Tina Fey), in a house up o a hill overlooking the ocean. His father, Koichi (Koichi), is a sailor and often away at sea. When playing by the ocean one day he finds a strange goldfish who he keeps and dubs Ponyo (Noah Lindsey Curtis). 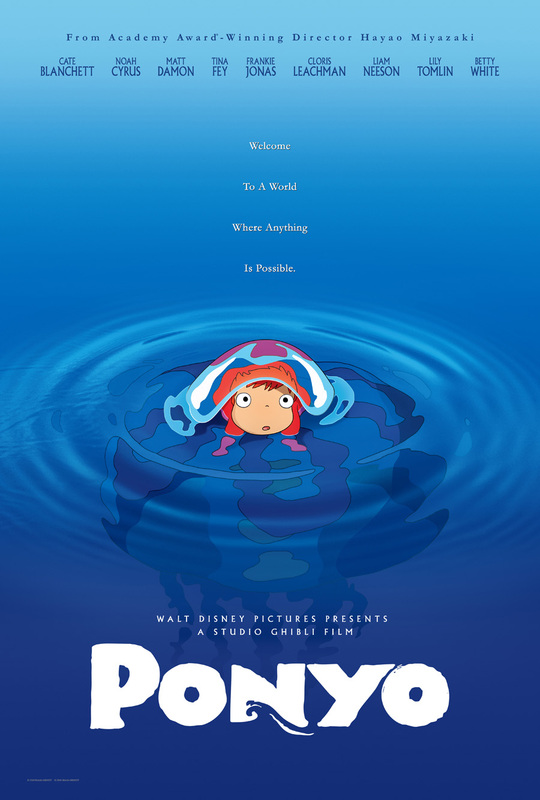 Ponyo is actually the daughter of an alchemist (Liam Neeson) who lives under the sea and seeks to restore balance to nature and her mother is a goddess. Ponyo licks a drop of blood from Sozuke’s cut hand, and eats ham, which begins her transformation into a human. When her father brings Ponyo back, she escapes from the globe he keeps all of his many goldfish daughters in, and gets into his elixirs, allowing her to become a girl and join Sosuke at his home. It also results in a tumultuous explosion of energy in the ocean, causing huge storms and flooding and the return of many prehistoric species of fish. Ponyo’s father and mother agree to test Sosuke, and if he passes, Ponyo can remain a girl. Why Watch it Today? : Hans Christian Anderson, the children’s author whose tale “The Little Mermaid” forms the loose basis of today’s film, was born today in 1805. You can read our full review here. This entry was posted in "Foreign Film", Adaptation, Animation, Anime, Arthouse, Based on a Folk Tale, Based on a Short Story(ies), Based on Myths, Fairy Tale, Family, Fantasy, Movie of the Day and tagged Betty White, Cate Blanchett, Cloris Leachman, Disney, dubbed, fairy tale, Hans Christian Andersen, Hayao Miyazaki, Japan, Liam Neeson, Lily Tomlin, Matt Damon, Studio Ghibli, Tina Fey, Toho. Still can’t get over the soup-to-milk description. Refresh my memory, its been a while.